The Philips SXA is a rather large, extremely robust handheld transceiver that can also do double duty as a hammer, a wheel chock for a truck, or an anchor for a small boat. Designed in 1979, it features five crystal-controlled channels, and models were available for low VHF, high VHF and UHF, with power ratings of 1W, 2W or 5W. My UHF model puts out 2W, and has crystals for 434.200, 434.300, 434.500, 434.600 and 434.625. The last two are set up as repeater channels transmitting at 1.6 MHz below the receive frequency. They're beautifully made, with the receiver and transmitter on separate PCBs which are both hinged to provide access. And as mentioned, you can drive a truck over one and it will still work. As you can see, the previous owner removed the (presumably stuffed) batteries and brought out wires to power the rig from an external source. 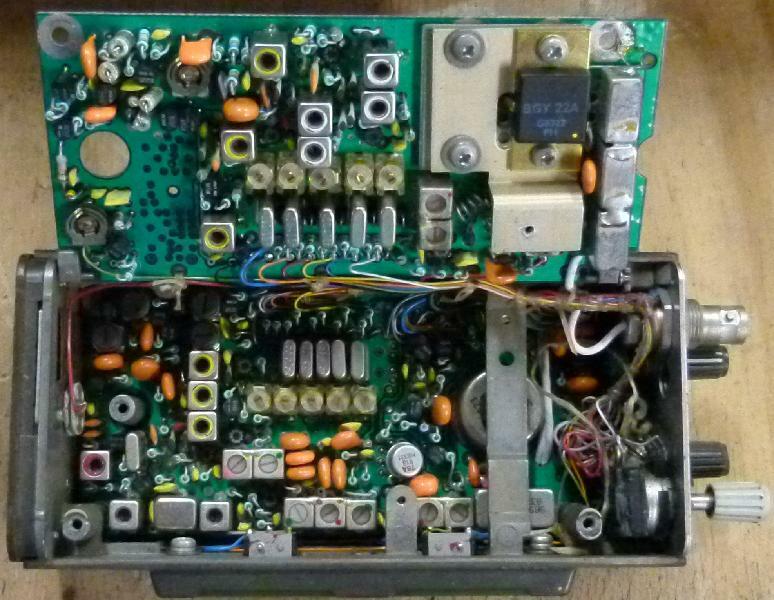 The battery pack is just ten "AA" NiCad cells, so rebuilding it is no great effort, and this one already has crystals for amateur frequencies so with a little work I can have a really large UHF transceiver. In contrast, the Baofeng UV-B5 next to it covers both 2m and 70cm, puts out 5W, has 99 channels, dual VFOs, subtone (CTCSS) to key the repeater, DTMF, a scanner and an FM radio. And there endeth today's lesson in how far we've come in 35 years. I have a second SXA, missing half the mechanicals. I'm toying with converting it to APRS. Same as the VHF models. To get the Tx board working in standalone mode, you need 12V on the red (PA supply) and white wires with ground on blue. Ground one of the five (blue, yellow, red, grey and white) wires connected to the crystals. The black wire isn't connected to anything on my board, and green is the modulation signal. Easy. The receiver crystals are for 434.625, 432.000, 453.475, 453.425 and 453.525. Again, the last three crystals have the actual frequency on them, 54.009375, 54.003125 and 54.015625. The receive IF is at 21.4 MHz, using a Tonron MCF21M15D 8-pole 15 kHz wide crystal filter. Getting the Rx board working in standalone mode is equally simple, as long as you realise that the pot with the switch on it is the squelch not the volume control. I recommend leaving the receive board in the aliminium chassis, it seems to need the shielding. Ground a wire to select a crystal, connect 12V to the red and blue wires, and you should be GTG. Audio amplifier is a Philips TBA915. A BGY22A 420 - 480 MHz RF amplifier module is used to provide 2.5W output. It's designed for FM only -- there goes my idea of hacking this thing to do SSB. You can get the Service Manual for the VHF versions off of Google Drive. It's in Dutch but that doesn't bother me. Also, schematics are kind of a universal language.